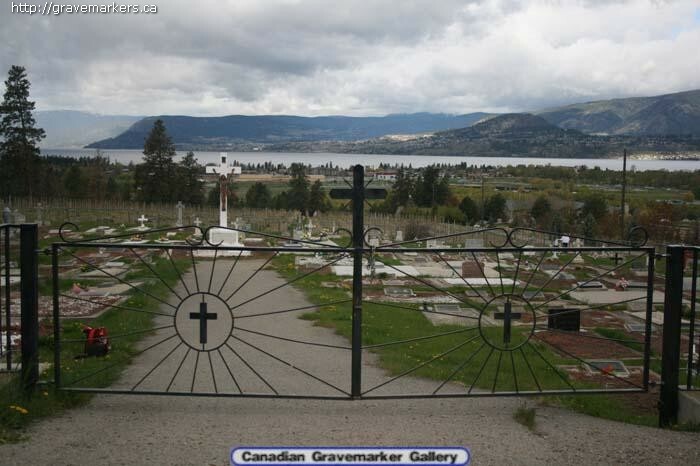 This cemetery is in the Southeast area of Kelowna. From Highway 97 (Harvey Ave) in central Kelowna, turn south on Gordon Dr and continue for about 3.7 km. At Casorso Rd, turn left (east) and continue on Casorso Rd about 2.5 km. The cemetery is on the right hand (west) side of the road. The main gate to this cemetery is locked. On weekdays, the key can be obtained from the Immaculate Conception Parish Centre at 839 Sutherland Avenue, Kelowna. There is another smaller walk-in gate that is not locked. Photos courtesy of Bettina Garry . The Canadian Gravemarker Gallery and the Kelowna & District Genealogical Society collaborated to bring these photos online. Thanks to Gwen N., Eileen R., Jennifer R., Bette T., Carolin, and Susan C. for assistance. Special thanks to Murray Pletsch who first made these photos available on his Canadian Gravemarker Gallery.